Solution: Propylene, C3H6, is a gas that is used to form the important polymer called polypropylene. Its Lewis structure is shown in the diagram.What is the total number of valence electrons in the propylene molecule? 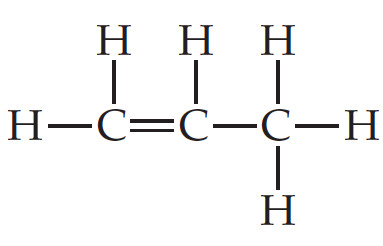 Propylene, C3H6, is a gas that is used to form the important polymer called polypropylene. Its Lewis structure is shown in the diagram.